The Dell Factory Install process incorporates network operating systems and partitioning on Dell servers at the time they are purchased. Dell PowerEdge server customers have the option to Factory Install Windows NT, Windows 2000, Windows XP, Red Hat Linux, and NetWare onto their servers before delivery. Dell offers many options to customers who purchase PowerEdge® servers. One of the most important and cost-effective is the Factory Install (FI) capability, which loads server operating systems, drivers, and disk partitioning at the Dell® factory before shipping. Although few computer buyers would ever purchase a new laptop or desktop computer without a manufacturer-installed operating system (OS), many customers purchase new servers without requesting that the network OS be installed. Dell customers can order most operating system products, including Windows NT® , Windows® 2000, Red Hat® Linux® , NetWare® , and the associated variations, such as Small Business Suite (SBS), to be factory installed on their PowerEdge servers. When customers select the FI option, Dell performs a complete product installation by laying down the most recent drivers and partitioning the disks to maximize server performance. The customer must perform some steps for legal and security reasons, or for integration of the server into a specific customer LAN environment. Typically, customers can complete these steps in less than 30 minutes. The end result is a complete system that is ready to run quickly upon arrival, which frees Information Technology (IT) resources for other tasks. The Dell FI for an operating system not only saves the customer time, but also eliminates the potential for problems. First of all, factory installation eliminates the time-consuming process of copying files from the CD-ROM media. Secondly, the correct device drivers and other configuration details of the server are determined in the factory and selected automatically. Finally, Dell's FI process ensures that the most current patches and updates are immediately available to be installed on each new server (see Figure 1 ). Dell uses a structured process in which each step specifically supports each device or peripheral installed on the server. The installation process intelligently identifies each device, runs appropriate tests, and configures that device to achieve high-performance metrics, thereby eliminating unneeded overhead. For example, the Dell FI process for NetWare loads the NetWare Loadable Modules (NLMs) and drivers for RAID management (for example, Dellmon.nlm and Dellmgr.nlm). The factory installation process does not merely lay down the OS image, but it also tests all of the driver installs to ensure their proper setup and functionality on each unique system. In short, the Dell FI is not a one-size-fits-all install, but a unique set of tools and processes that deliver excellent performance accompanied by robust reliability. This Dell-developed technology is available at all Dell factories around the world. It is particularly effective for use with the new Red Hat Linux and Microsoft® operating systems: Windows 2000 Server and Advanced Server. Because of the unique Dell factory process, the factory-installed implementation of the Microsoft operating systems—Windows 2000 Server and Advanced Server—and Red Hat Linux provide even faster install times. Once the system is properly cabled together and powered up, a mere six minutes is required for a fully operational operating system. The hard drives are fully formatted; multiple RAID containers and partitions are set up; all device drivers are loaded and tuned for peak performance; and the whole system operates without any conflicts. The Dell installation of Windows 2000 allows end users to further configure the OS and to enable specific services that are present but not enabled. The system can be added to an existing network or configured for innumerable tasks or functions, which build on the basic Dell Factory Install. In fact, some of these functions can be ordered already installed on the server. In a recent study, Dell compared the time differences for using Dell Factory Install versus manual customer installation using the Dell Server Assistant CD-ROM or the vendor operating system CD. The basic installation time and the required support time for both methods were included for each of the operating systems: Windows 2000, Red Hat Linux, and NetWare. The results, shown in Figure 2 , indicate a dramatic savings in time when using the Factory Install method. Dell Factory Install also requires less support. In the study described above, 48 percent of customers who purchased Non-Factory Install (NFI) servers called Dell Customer Support. With an average call wait time of two minutes and 15 minutes to resolve the issue, this adds an average of another eight minutes to the setup time for NFI servers. 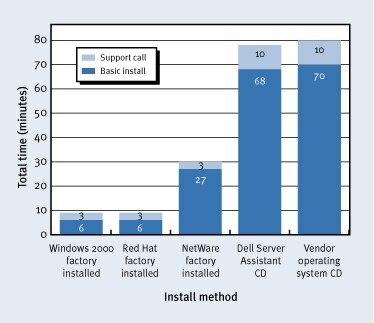 In comparison, only 20 percent of customers who purchased their operating system factory installed on servers called Dell Customer Support, with the average call of two minutes wait time and seven minutes to resolve the issue. This adds an average of two minutes to the setup time for FI servers. The results of this study indicate that Dell customers save an average of 48 to 50 minutes per server, while Dell/Microsoft or Dell/Red Hat customers save an average of 69 to 71 minutes per server (see Figure 2 ). The Dell FI process incorporates several components for a complete installation. Device drivers. Dell's FI process ensures that the correct, validated, and most recent available versions of network interface cards (NICs), SCSI host adapters, and RAID controllers are installed at the factory. These drivers are included on the Dell Server Assistant CD-ROM, if they are not part of the specific OS media that shipped with the server. Dell also configures optimal system parameters (for example, Maximum Receive Buffer Size) for each OS. This enhances system performance for multiple NIC configurations based on which OS they are using. These actions virtually eliminate the chance that the customer will encounter any problems—from the moment the server is removed from the packaging to the time that the server is integrated into the customer's LAN. It also means the customer has all of the necessary media for re-installation of the software, if necessary. Patches and updates. During the FI process, Dell installs the most recent support pack for the particular OS. This eliminates the need to download these files from the Internet. Improved disk drive partitioning. 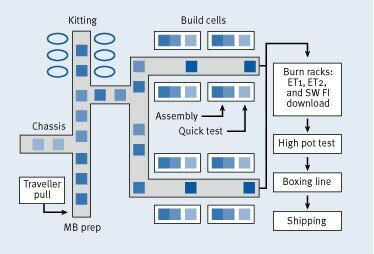 Dell's new, improved disk partitioning strategy is to design unique partitioning programs for each OS and to maximize the capabilities of the particular OS. The most significant improvement is the NetWare partitioning program. The new program formats the first physical disk drive or RAID volume to be used as the boot drive. A DOS partition is created on this drive; that is the partition from which the OS is launched. Note: Dell configures this partition, including the CD-ROM extensions (MSCDEX) as an additional convenience to the customer. A portion of the drive is set up as a SYS partition, with the remainder of the drive space left free. NetWare customers can then set up any remaining disk drives to suit their own preferences or business standards. Dell can deliver a wide variety of operating systems, factory installed, on any PowerEdge server. In minutes, even the novice customer can have a server ready to run. Dell also offers on-site custom installation services through Dell Custom Factory Integration and custom integration of previous versions of OS programs. Using Dell Factory Install can produce quantifiable cost savings in resources and time for large, medium, and small businesses and public organizations. Len Fischman (len_fischman@dell.com) is a project manager for OS Development in the Enterprise Systems Group. Len served 20 years as an Air Force engineering officer. He has a B.S. in Industrial Engineering from the University of Nebraska at Omaha and an M.S. in Aviation Science Technology from Embry-Riddle Aeronautical University.